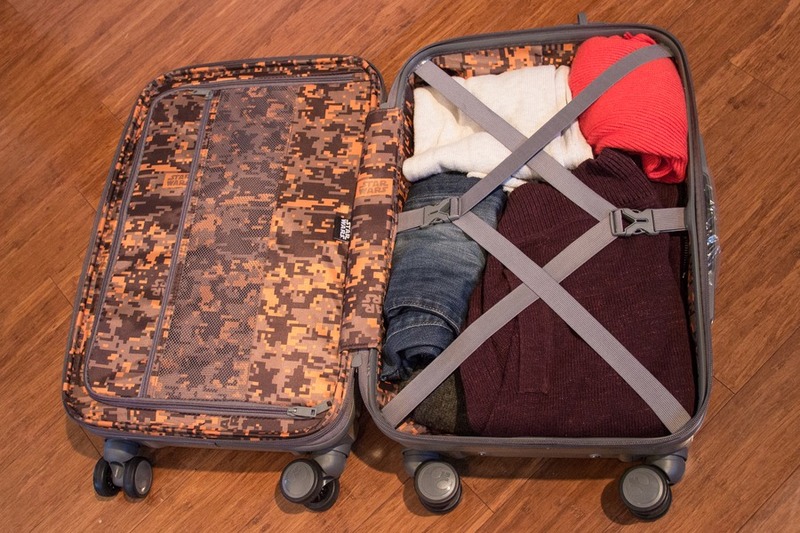 With the never-ending variety of colorful and inventive clothing, shoes, and accessories in the world, why is it that almost everyone has plain black luggage? Why are we all so BORING? I think it stems from the outdated idea that flying is for fancy business people and we all have to look like we’re on our way to “an important meeting”. But we aren’t all on business trips! Lots of us travel for fun, so why don’t more people embrace luggage that shows off their personality? Just imagine - the luggage carousel could be a mountain of fun and whimsy - not just a mound of black nylon and plastic. For example, check out American Tourister’s new Rogue One roller bag. Are you pulling for the Rebels or the Empire to rule the universe? With this bag, you can show the world your alliance! Pictured here is the Rebel version. There’s a black Empire version, too. This limited edition 20” spinner is super light - just 7 pounds - making it easy for anyone, including kids, to handle. It has a rugged, molded shell, retractable handle, and get this: the hubcaps of the four wheels even have the Rebel insignia on them! And while it’s ultra-light, you can tell it’s high quality due to details like the rubbery handle that feels great in your hand. What are the advantages of choosing unique luggage like the Rogue One, you ask? 1. The most obvious reason is that it stands out. It’s easy to spot a unique bag on the airport carousel; you don’t have to stress about eagle-eyeing every black plain suitcase that passes you by. You can even relax and stand back a few feet while the luggage vultures teeter on the edge of the carousel, trying to find their dull, conformist bags. 2. It’s a conversation starter that shows off your personality. People like feeling kinship with others who appreciate our interests, sense of humor, and style. When someone says, “Cool bag!”, you can’t help but feel good inside. 3. Life is short; why not do what makes you happy? My Rogue One bag makes me smile every time I look at it. A black suitcase equals despair and sadness. Fun suitcase equals joy and laughter. It’s like therapy, but on wheels. 5. Your kids will love it. And your inner kid will enjoy it, too. If your child is jazzed about their suitcase, they’ll be more likely to help pack their things and roll it along proudly. A great way to motivate a young globetrotter is with a fun suitcase that they’ll remember forever. Variety is the spice of life, so I’ve decided to spice up my suitcase! No more boring black for me. With creative, fun options like American Tourister’s Rogue One roller, I can show off my personality and add a bit more fun to traveling. Which one would you pick – Rebel or Empire? I work for an airline, and when we ask for a description of a passenger bag that we are looking for, 75% of the time it is a black roller bag (which just gets lost along with the thousands of other black bags). If you are the owner of one of these nondescript black bags and a new bag is not in your immediate future, my favorite luggage identification marker is neon colored duct tape. In addition to making your bag easy to identify, it provides extra support for the bags zippers! I want this suitcase now, it does look really cool. I think a lot of us go for the boring suitcases (even when WE find them boring) is because that's what you usually see being sold and they tend to be on the cheaper side then the cool unique luggage. I am in love with the Rebel suitcase though. @Shanna thank-you for the tip I will use that in the future!